Ring Nebula, Crab Nebula, Pleiades, Uranus and then some! Tonight has been quite a satisfying nights viewing. Just in my back yard which has street lamps shining in from a couple of directions, but I put my big patio umbrella up to shield the light, and I’ve also recently flocked the interior of the XT10, which makes a noticeable difference to the view contrast, and I have my new Baader UHC-S Filter which in a previous post I couldn’t be sure of what difference it made. Well tonight was a much better, clearer, brighter night, and the filter does indeed make the sky blacker, so it must be cutting out some of the white light glow from the mercury streetlamps. Albireo (Cyg A) and Cyg B double. My friend JamesB had told me this was a nice colourful double to view, Cyg A is spectral type KIII+ and Cyg B is B8V. A is the primary member of the system, a golden yellow or “topaz” star shining at 3rd magnitude, while B is known as the companion, a fainter 5th-magnitude star with a beautiful bluish color. Ref link. Ring Nebula in Lyra. I’ve wanted to view this nebula for quite a long while, and tonight I found it, purely by star-hopping. It is quite easily found, and I viewed it with a variety of eyepieces and Barlow to see what I could make out, the actual ring was fairly clear, but I was unable to resolve the central star. Ring Nebula on Wikipedia. M56 Cluster. This again I found by star-hopping, and lies about half way between Albireo and Sulufat in Lyra, near the Ring Nebula. A nice but quite faint cluster. Uranus. Next I noticed in Stellarium that I might be able to see Uranus between the head of Pisces and Aquarius. Again this would be a first for me so thought I would try to locate it according to the position shown on the laptop. I figured it might possibly be visible through my 20×80 binos, so got those out and set them up on the tripod with the ST90 counterbalance. After some hunting around familiarising myself with the stars in the area (in particular a pretty rocket/arrow shape formed by HP114914A and 3 surrounding stars, with 3 small stars in a line), and comparing with the view in Stellarium, I was surprised at how visible it was at around mag 6. I was just able to see if with the naked eye, also easily with the binos, and I could clearly make out the disc of Uranus with the XT10, but didn’t think to pay attention at the time whether I could make out any of its moons (didn’t think about that until back at my computer indoors looking at Stellarium again). The moons reminded me of the song Astronomy Domine by Pink Floyd - “Oberon, Miranda and Titania”. However, Uranus was fairly low in the sky, and also there was some light wispy cloud cover over that part of the sky which was not helping. Still, it was a nice catch! Pleiades. Well I just love these stars, and always enjoy looking at them. I love their clear bright view. For amusement I tried counting how many I could see in this cluster with the XT10, but gave up at around 60 stars! I think I could even make out some of the faint nebulosity around the stars. Aldebaran in Taurus. Next I worked my way down to the Taurean stars and marvelled at the orange/red of Aldebaran and pondered for a while the immense size of this star. NGC1647 (Open Cluster). Just about 3 degrees to the north of Aldebaran is this nice open cluster. Crab Nebula. While in this vicinity I thought I would try to find the Crab Nebula. This is a nebula I have tried to find before, but conditions weren’t good enough the last time. This time I discovered it was just barely visible with the 20×80’s (with averted viewing) and quite pronounced through the scope. This was approx 3.5 hours stargazing from 9.30pm to 1.00am. I would have liked to continue, but by now the night air was getting pretty chilly, and dew was starting to become a problem. Also my dog Ben was getting a bit bored and wanted to go in! I wonder how folk are getting on at the Kelling Heath Star Party this week and weekend, and whether the weather has been kind for them? Yesterday evening I got home from work and took the dog out for his walk. It was a lovely clear night and the stars were nice and bright, so I was feeling quite excited about the prospect of some decent star gazing (wifey is away tonight). Got back home and immediately took my XT10i telescope outside to start cooling down. Next I went in, did the dogs supper and prepared myself some tea, and ate it quickly so I could get back out for some observing. I was about 20 minutes in all. Went back outside and couldn’t believe it. Once again those blasted clouds had moved in to spoil the fun. Damn! Oh well. Plan B. At the weekend I had ordered some Protostar black velvet flocking material to line the inside of the scope to reduce reflections from ambient light bouncing off the insides, and so increasing the contrast of the view. And it had just been delivered that morning. So I set about carefully dismantling the scope to remove the primary and secondary mirrors, and the finder scopes, so I could install strips of the flocking material easily. The job took about 2.5 hours, by which time it was too late to put everything back together. Tonight I decided to finish the job by cleaning both primary and secondary mirrors, and adding a touch of black matt paint to various bolts inside that were shiny, and apply some to the edges and back face of the secondary mirror. I carefully followed instructions for the best method to clean the mirrors, so as not to scratch them or remove their aluminised protective coating (I’ve had the scope almost a year now and a fair amount of dust has gathered on the primary). Finally I re-assembled everything and re-collimated the mirrors as precisely as I could. When all was done I took the scope outside to see what improvement the flocking had given. It’s been a fairly clear night, with the occasional cloud passing over. The Pleiades were visible so I lined up on them and checked it out. Now my rear garden has a white light (mercury) street lamp to the North side, and I have always noticed when pointing the scope to the North or East, that the light entering the end of the scope tube (unless I get our large patio table umbrella out to shield the light) always gives a lightening or greyness to the view. But with the new flocking there is a considerable difference, with a very much darker view, which does indeed give better contrast. Certainly looking down into the tube from the top it looks very dark inside. Nice one. As usual I have taken some photos of the flocking work, and will create a new page in my main web site describing how it was done, and where I got the material from. Watch this Space. Tonight at first sight looked promising with stars out, but not very good transparency. I started by setting up my 20×80 binos to try them out with the ScopeTeknix Zodiac ST90 counterbalance binocular mounting which I bought at the same time as the binos, but until now have not had the opportunity to use them. The counterbalance mount is very sturdy and heavy (needs to be to handle the 20×80 binos which themselves are quite hefty beasts). While they work quite well with my tripod, really the tripod itself which previously I had bought for use with my SLR camera, is not sturdy enough, and could ideally do with being a bit taller. Care is required when adjusting the tripod height, because the weight of the combined bino+tripod can overwhelm the height crank, and if you’re not careful the crank handle suddenly starts to spin, and bump, the binos and counterbalance drop down. Of course quite typically within the time it took me to setup the binos for viewing, clouds moved in! But since it was quite a pleasant dry evening, I thought I would push on and get the XT10 out too, in the hope that the clouds would clear later in the evening. One thing I wanted to do was have another go at configuring the Intelliscope Computer Object Locator to interface via RS232 thru USB port and an ASCOM driver, to work with Carte du Ciel on my laptop. With no stars visible I had to make do with guesswork alignment, i.e. point the scope at roughly where I knew a couple of alignment stars were. I knew this would be totally inaccurate, but all I wanted to do was understand what settings were required to make the software read from the Intelliscope, and be able to track movement of the OTA as I moved it, updating on screen to show where it was pointing. This task worked, and later on the clouds did indeed clear, and I was able to make a more accurate alignment, and check the software tracked what I was pointing at accurately too. The objective for tonight was more to re-familiarise myself with the Intelliscope plus tracking software, while some checking for certain problems I had noticed with losing the tracking connection if other Intelliscope buttons were pressed, would have to wait for another brighter stars night. Next I wanted to try out my new Baader UHC-S Filter to see what effect this would have on observing things. It is designed to cut out light pollution from mercury and sodium based street lamps, so that the view has more contrast. First I sighted up with the binos to see if M31 The Andromeda Galaxy was visible, and eventually found it in the binos. I then manually located Andromeda in the XT10, and tried out the filter with a couple of different 1.25inch eyepieces which the filter would screw into. The filter didn’t seem to have much effect, but this could be for a couple of different reasons; a) its the first time I’ve used it so I don’t know exactly what to expect, b) this galaxy may not be quite the right thing to use the filter for viewing, c) the view may not have been bright enough, due to the poor transparency (while I was trying the filter out, more clouds came in and halted my comparisons). So I think more experimenting is required to see how effective the filter will be on a clearer brighter night. Tonight has also been the first time I’ve used the scope properly since adding the “carpet brakes” to provide some stiction to the Lazy Susan bearing modification I recently did to the dobsonian base. The scope moves very freely now, but the carpet brakes appear to work well, providing about the right amount of stiction. Finishing off before a swaith of clouds rolled in to put an end to my nights observations, I observed the Moon, very low down and red hued, and with the seeing playing its usual tricks to try and mar the view, and also explored around Cassiopeia for anything of interest, and came across M103 and NGC457, both open clusters. So it was a bit of a mixed bag of things I did tonight, but mostly just for want of getting out there and trying something out despite the usual poor views and bad weather. I really hope that as September draws to a close, and the nights get longer and darker, that the skies will clear up and start to reveal their gems again. The latest mod I have added to my Skyquest XT Mods section is for my Orion XT10i and details the simple addition of a new dovetail mount so that I can have both my standard 9×50 Finder Scope, and my new Multi-Reticule LED Red Dot Finder Scope mounted to my telescope. The finder is very light, well-made and nicely finished, easily and accurately aligned with click-stop adjustment screws. The article has pictures of this great, reasonably priced red-dot finder scope from ScopeTeknix, and shows the new dovetail mount in place, with the finder mounted. Addition of a dovetail mount for a red-dot finder scope. 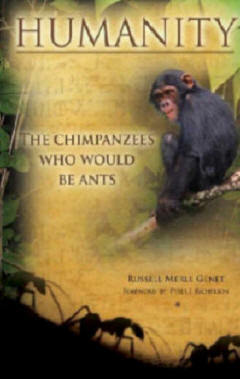 I have just finished reading the book Humanity: The Chimpanzees Who Would Be Ants by Russell M. Genet, Ph.D. This fascinating book is the science-based story of how, in a remote corner of an ordinary galaxy 13.7 billion years after the Big Bang, the descendants of a third line of chimpanzees evolved into millions of humans who organized themselves into ant-like societies. Originally rare hunters, we humans took up agricultural ways, aping the clever ants that became numerous by developing ingenious herding and gardening skills. Evolving our simple chimp tools into machines, we then tapped a bonanza of fossil fuel energy and blitzkrieged the planet. Now facing planetary limits, what is our fate? Reversing direction, will we return to a planetary Garden of Eden or, pedal to the metal, crash into oblivion? Will we transform the Earth into a sustainable global farm or, leaving our birth-planet behind, voyage to the stars with our machine partners to establish a galactic empire? For me Part 1 of the book was probably the most revealing, and I learnt a great deal about the beginning phases of life. It was incredibly interesting, especially the process from quarks, to hydrogen and helium, then supernovae creating the heavier elements, then atoms to complex molecules, cells, bacteria and genetic DNA. I had hitherto not understood how the engine of gravity and stars built the first stepping stones to life. Absolutely fascinating. Parts 2 and 3, confirmed my own thoughts and feelings about cultural evolution, governmental and religious control, and the stupendous speed at which we have evolved, whilst these sections of the book provided the necessary grounding on our chimpanzee descendants, our similarities to ants, how we changed from hunter-gatherers, to agricultural farmers, while reminding us about a number of cultures that quickly developed and just as rapidly became extinct, and how the machine age brought about our ruthless efficiency. These again provided much food for thought, and more importantly led me to a more positive mindset and direction for the future of mankind. Russell M Genet is a Research Scholar in Residence at California Polytechnic State University. He is an adjunct professor of astronomy at Cuesta College in San Luis Obispo and as the Director of the Orion Observatory, observes eclipsing binary stars and studies cosmic evolution. Russ, who pioneered the world’s first fully robotic observatory (featured in the PBS special, The Perfect Stargazer), was the 51st President of the Astronomical Society of the Pacific. He teaches Astronomy at Cuesta College on California’s central coast, where he lives with his wife and childhood sweetheart, Cheryl. and you can read Russ’s Cosmic Perspective for further insight into his book. I like this post about 10 Things You Don’t Know About the Earth, very interesting……. Phil Plait, the creator of Bad Astronomy, is an astronomer, lecturer, and author. After ten years working on Hubble Space Telescope and six more working on astronomy education, he struck out on his own as a writer. What if you dug a hole through the Earth and jump in? What would happen? This and 9 other astounding facts are provided for your entertainment and enlightenment! For instance, did you know the Earth has 5 Moons, sort of? I have added a new page to my site describing the modification to the Orion XT10 to replace the original Teflon bearings with a Lazy Susan turntable bearing. This is one of the primary mods Dobsonian owners are interested to learn about, in their quest to achieve the smoothest possible Azimuth movement. The standard Teflon bearings suffer from a problem termed “stiction” that causes adjustment of the view in the eyepiece to become quite difficult when observing at high magnifications. The mod involves the addition of a slimline Lazy Susan turntable with ball or cylinder bearings, but this results in a motion that is so smooth that even the wind can blow the telescope around! So a simple method of replacing some of that “stiction” becomes necessary. In this section I discuss the main concerns, such as maintaining correct operation of the Intelliscope Computer Object Locator, with references to forum topics, other resources on the internet, including suppliers of suitable Lazy Susan bearings. The mod is done in a non-destructive way, so you can revert to the original Teflon bearings if required. The page also features a short movie clip demonstrating the effect of the new bearing. I have recently added two new sections to the main www.Orion-XT10.com website. Resources - is simply a proper place for my collection of Orion XT10 related web sites , other reviews, mods info, equipment and maintenance links. There are also more generally Astronomy related links. 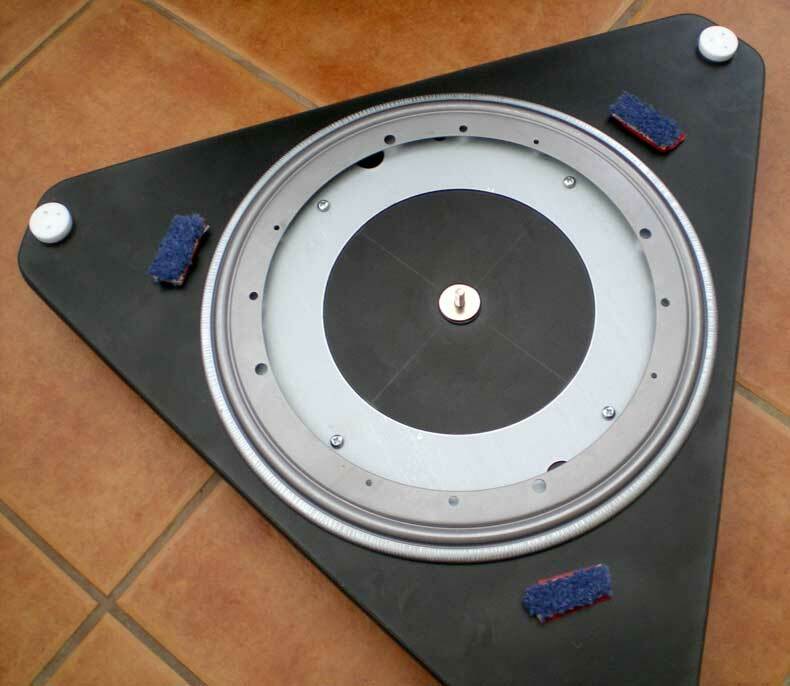 Straight away I have added a fairly major topic of interest to the XT-Mods section, which covers the Addition of a Lazy Susan Turntable bearing to the Orion XT10 . What a bizarre combination of sightings this evening. Early evening we had a fantastic thunderstorm. I love the power of a storm. The sky was incredibly dark, with fork lightning zipping across the clouds, and since the sun was setting from the opposite direction it was perfect for a strong bright rainbow to form, in a full arc over the fields behind our house. 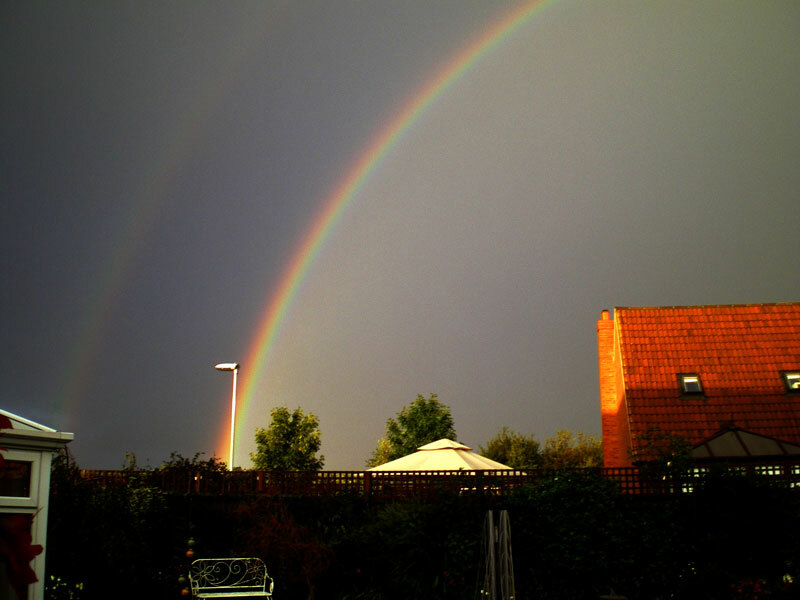 In fact there was even a second fainter rainbow arcing over the first. Of course rainbows often occur with thunderstorms, and this was quite spectacular, with the bows and the lightning together. Later in the evening the skies cleared and a miracle happened - yippee, the stars came out!!! It seems absolutely ages since I’ve seen a nice clear starry night. There were still too many fleeting clouds to warrant getting my XT10 telescope out, plus the fear of more showers, so instead I took my 20×80 binoculars to the pagoda at the top of the garden and settled down for some enjoyment of the night views. I took in Jupiter and its moons briefly before some cloud cover rolled in, and mistook Arcturus in Bootes for Saturn. Later I scouted around the regions of Ursa Major to see if I could make out any of the galaxies in this area, but I think the night air was too damp to allow me to see them with the binos, or I was just not concentrating on the right patch of sky (I had not taken any star atlas, nor the laptop outside because everything was too wet from the rain storm). Next I viewed the beautiful star-studded jewels of Cassiopeia, and the wonderful clusters abiding within. Usually during the course of an evenings viewing I will see several satellites individually crossing their own part of the sky, some blinking as they spin, others just moving steadily overhead. But tonight I saw something that made me do a double-take and confused me for a moment. As I panned the binos on the tripod I suddenly wondered which direction I was actually moving them, because while some stars were moving, as expected, in the opposite direction to what I panned, 3 stars had suddenly appeared that were going roughly the same direction I was panning. “Eh? How can that be” I thought, until I followed them and got them centred in the view, and realised that they must be satellites, but ALL three were moving in the exact same direction, and in a triangular formation. It’s the first time I’ve ever seen this, as if they were flying together deliberately in a group. So I tracked them as far as I could and very, very slowly the triangle formation changed shape, so they were in fact travelling at slightly different speeds after all. It was very strange to witness, because at first it looked as if they were intelligently flying as a group! Finally I quite accidentally came across what at first I thought was Comet Holmes again. It looked the same indistinct fuzzy ball as I had seen a few months ago, when the comet exploded into life, but I thought that the comet was supposed to no longer be clearly visible. After consulting the excellent Stellarium astronomy software, I am certain that what I stumbled upon was the Great Cluster in Hercules. For a while I have been meaning to search this cluster out to see what it would look like in my new giant binos, so when I found it by chance this was quite a nice discovery. The last time I saw the Great Cluster was on my holiday in S.France, when I only had my 10×25 binos, and then the cluster looked very pale and small. In comparison the 20×80’s made the cluster very easy to spot, and to appear quite impressive. So all in all quite a pleasant couple of hours observation, with quite a unique collection of visual spectacles during the course of the evening. The one thing I learnt was that with such long gaps between decent viewing nights (due to the crap weather), I have forgotten the locations of some of the constellations and stellar objects, and some revision is necessary, with star atlas on hand. 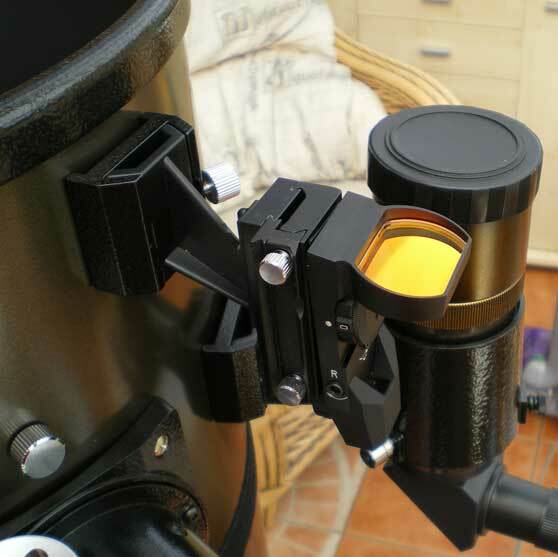 Today I modified my Orion XT10i telescope by adding a second dovetail mount to accept a multi-reticule red-dot finder scope on the main telescope. I purchased the red-dot finder as a new accessory a few months ago now, but obviously could only use one finder at a time with the single dovetail mount installed on the XT10. This modification means that I can now have both the standard 9×50 finder, and the red-dot finder permanently mounted without having to swap them over. This also has the advantage that both scopes will remain accurately aligned, because removing and remounting them previously caused them to go slightly out of alignment. The red-dot finder is very easy and intuitive to use, I think more so than the 9×50 which I often tend to get lost with when sighting stars. The 9×50 is quite a good finder, with a nice level of magnification to enjoy looking at the stars with in its own right, but it is made all the more useful by having the red-dot finder as a companion. Adding the dovetail mount to the top of the XT10 was quite easy to do, although some careful consideration was given on the placement of the mount before actually drilling the OTA. I have taken some pictures and will in due course create a new page on my web site detailing the mod.